Edit PDF files just like a vector objects. You can select, scale, move and rotate all objects (text, pictures, lines etc.) with a few mouse clicks. With the tool "Free text edit" you can change existing text just like a text editor. If you press "Return" a line break will be inserted and all following text objects will move down. This new kind of PDF Editor is much faster in because of the new object concept. 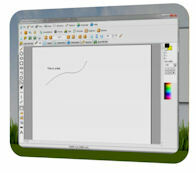 PDF Editor Objects other features are: copy and paste, delete objects, paint on existing pictures, add new vector objects. Add annotations, underline, highlight and strikeout text and edit bookmarks too. Change the order of the pages, delete pages, extract pages or add new pages (empty pages or from other pdf files). Add stamps like "Confidential" or "Top secret". The source code of the page (a language like HTML) is editable for you. Use the program to read and write encrypted pdf files. Qweas is providing links to PDF Editor Objects 2.6 as a courtesy, and makes no representations regarding PDF Editor Objects or any other applications or any information related thereto. Any questions, complaints or claims regarding this application PDF Editor Objects 2.6 must be directed to the appropriate software vendor. You may click the publisher link of PDF Editor Objects on the top of this page to get more details about the vendor.